So you want to install an in ground trampoline in your back yard. 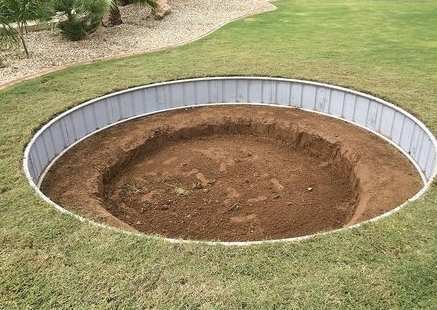 You have weighed the costs, you have considered the problems that you will face digging your trampoline pit and you still think it is a good idea. The benefits to having an in ground trampoline do outweigh any negatives that come from owning one. You will get great exercise, improve your health and have a lot of fun. These benefits help you overcome the difficulties that arise as you set out to install your new in ground trampoline. There are three things you must do before you put your shovel into the ground. Phone your local city hall - you will need to get information about your back yard before you do anything else. You need to know where to dig, if it is safe to dig, where any pipes are, including your own sewer and water lines. You also may need to know if you need to get a permit to install an in ground trampoline. Know the size of your trampoline - it is obvious that you cannot start digging if you haven’t decided how big the trampoline is going to be. You need to make this decision first, before you start your personal excavation. The once you know the diameter size, you need to an an extra foot to make allowances for the ventilation you will need. You may have thought that you are digging only 1 hole but that is not the case. 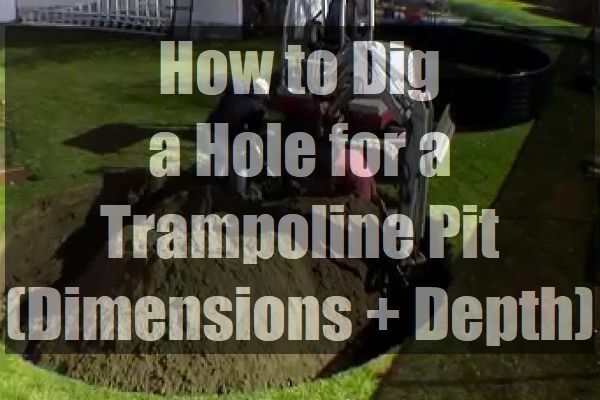 There are actually two holes that need to be dug in order to install your in ground trampoline properly. The outer hole is not going to be as deep as the inner hole. In fact, you only have to dig down 13 inches to get the right depth for the outer hole. This is basically the same measurement for an 8, 10, 12 & 14 foot diameter trampoline. The inner diameter hole is not so lucky. Each measurement for the inner diameter is different for each size of trampoline. The rule of thumb is to dig the inner hole 2 feet less in diameter than the trampoline’s actual diameter size. For example,. an 8’ diameter trampoline needs a 6’ diameter inner hole. A 10’ diameter trampoline needs an 8’ inner hole. The 12’ needs a 10’ inner hole and the 14’ needs a 12’ inner hole. The difference creates a nice ledge which you can put your retaining wall on. Of course, the outer and inner diameter size may not be absolute and some trampolines may require variances from the figures above. Then do not start to dig the inner hole until you have finished the outer one. Again these sizes may vary depending on the the brand of trampoline you buy. This is of great concern as you need to make sure you have the right depth for a number of reasons. The main reason you need to get the right depth is so that you have room to land and bounce backup. Hitting the ground is not a pleasant feeling. The outer diameter hole’s depth is standard for all 4 trampoline sizes. That hole should measure 35 cms deep. You should also have about a 30 cm. ledge going around the hole. If you are going to do it yourself, a few tips on how to dig the right sized hole with the right dimensions are always helpful. It is not a matter of just grabbing a shovel and starting digging away. ​Dig the inner hole in a bowl shape. This makes sure you have room for the bottom of the bounce. Depending on the size of hole you are digging and if you really do not want to shovel a lot of dirt, you can rent a mini digger to make the digging go a lot faster. The time it should take you to manually dig the hole is about 8 to 10 hours. Renting a digger can cut that time down to about 2 to 3 hours. With a circular hole, it will be difficult to use a long , straight 2 by 4 to help you smooth off the sides and ledge. 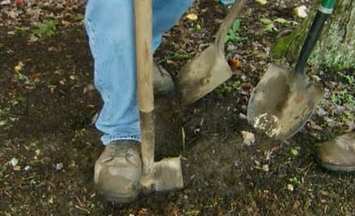 A square head shovel or a trowel can do the trick very quickly. You want to make sure you get as close to circular as you can. A small 1 by 2, 2 by 2 or 2 by 4 can also help you get the hole shaped to where it needs to be. This work may take you 1 to 3 hours depending on the size of your hole. Tip #6: Don’t remove your original outlines for the outer or inner holes. Leave them in place so you can shape the holes faster and get them as close to round as possible. The same goes for a rectangular hole. Keep them in place till you got the rectangular hole looking like it should. In most cases, using a mini-digger is always going to be better, easier and faster. It will save you a lot of time and energy which makes installing your in ground trampoline a lot better. Tip #7: if your installation is going to take several days, then make sure you have a large tarp to cover the hole on hand. If it rains, you will need to cover your hole. This protects the shape of your hole and keeps you from working in mud. Digging your hole does sound as bad as it really is. But there is no way to avoid digging if you want an in ground trampoline. The dirt certainly won’t move itself. To make digging easier on yourself just follow the simple steps above and make sure you do not ruin your outline. You can rent a mini-digger to make the digging part a lot easier and faster but these can be expensive. Not only in rental costs but fuel and oil costs as well. You also need to know what you are doing when you use a digger because one mistake could cause expensive repairs. It will take a little time to get the hole right for the trampoline you want to install. Just be patient and don’t rush it. When you go too fast that is when the mistakes start happening. Before you know it, your hole is done and you can install your trampoline and have a lot of fun.